My passion is helping others get better. Bowen gives me this ability to follow my passion. 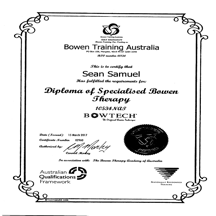 I am a Diploma of specialised Bowen Therapy & an Advanced Bowen Therapy qualified Therapist. I can also offer private health fund rebates depending on your level of cover. I have worked in the “alternative therapies” for over 6 years having worked in various clinics during that time. Being a family man, married with two children, I can readily relate to many pressures & issues confronting all of us in today’s day and age. Stress is a massive factor affecting most of us, – if not directly dealing/suffering from stress then knowing a loved one who is. It was in many ways stress that led me to my career in Bowen Therapy. The application of Bowen Therapy does not have to be hard & forceful, so if you are already riddled with pain then I do not have to make that worse for me to get awesome results for you. I can blend subtlety with power enabling me to change the direction & purpose of a treatment if required during a treatment. Its technicality is in its simplicity. Advanced Bowen Therapy qualified Therapist. I can also offer private health fund rebates depending on your level of cover. A Bowen session usually lasts up to an hour and frequently results in a deep sense of relaxation helping the body to recharge and balance itself naturally. Trained in the traditional style of Bowen Therapy as handed down by Mr Thomas Bowen, & having being taught by an amazing instructor I take much pride in upholding & being able to pass these principals onto my clients. Yes money is an important part of our lives but of even greater importance is time. In many ways now days, time is even more precious than money. We have such little time for ourselves & families. At Bowen Relief I believe that truly giving someone your time or even time just for them can be as therapeutic as the treatment itself. Why should you come & see me/what can I offer you? Can assist with relief of the physical symptoms of some mental ailments such as anxiety & depression, being overwhelmed, stress etc.